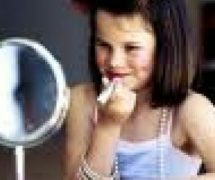 Home » News & Views » Health » Should Children Wear Make-Up? Do you think children should be aloud to wear make up? They are still young and shouldn’t worry how they look at their age. Make up could harm their skin. They can make themselves look stupid because they don’t know how to apply make up at such a young age. Do you think mothers should allow their children to wear make-up at such young ages and allow them to go and “show off” their look even though they are so young? Please post your comments below…..